... or black nickel-satin finish, or black painted. Suspension on steel springs. Adjustable seat in two positions. Cushion and headrest upholstered in polyurethane. Leather-covered cushions and armrests. ... and appealing, but without ignoring comfort. Harmonic curves and attention to detail make Diva an irreplaceable relaxation armchair, ideal for all modern homes. An armchair with a headrest may be designed to enhance comfort and relaxation. It also can help maintain good posture and take pressure off the back and the neck while working. On ArchiExpo, these chairs are defined by properties such as style or material. Such chairs are used indoors and out, in homes and commercial venues for relaxation and improved health. For example, a reclining model offers head support when the user is a horizontal. They also allow cinema patrons to sit comfortably for long periods of time. In offices, they improve posture and reduce strain. Wood, metal and plastic are commonly used to make these chairs, which are sometimes padded or upholstered. Verify that the chair is suitable for its intended purpose. Outdoor models should be weatherproof and easy to store. 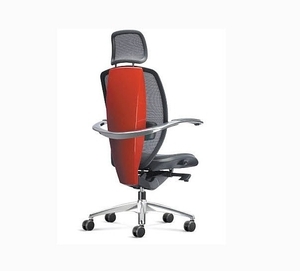 Those for office use may need to be adjustable to improve employee comfort and/or to comply with local regulations. Consider chair style in light of the surrounding furniture and determine maintenance requirements. Ornate models may be harder to maintain and repair. However, there are many modern, streamlined designs that are easy to clean and have replaceable components.